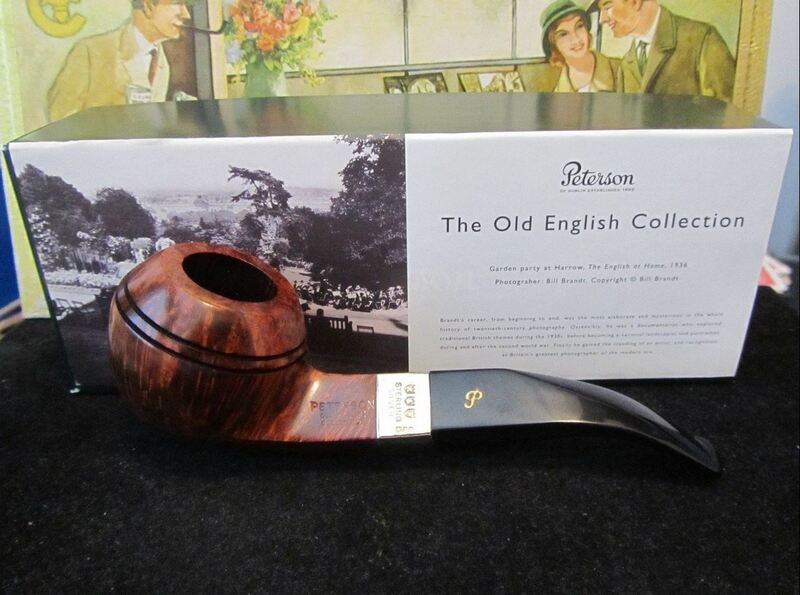 A few weeks ago, George Fachner of “Tinashobby” on Ebay began running the complete 1996 Peterson Old English Collection in unsmoked, individually-boxed condition. 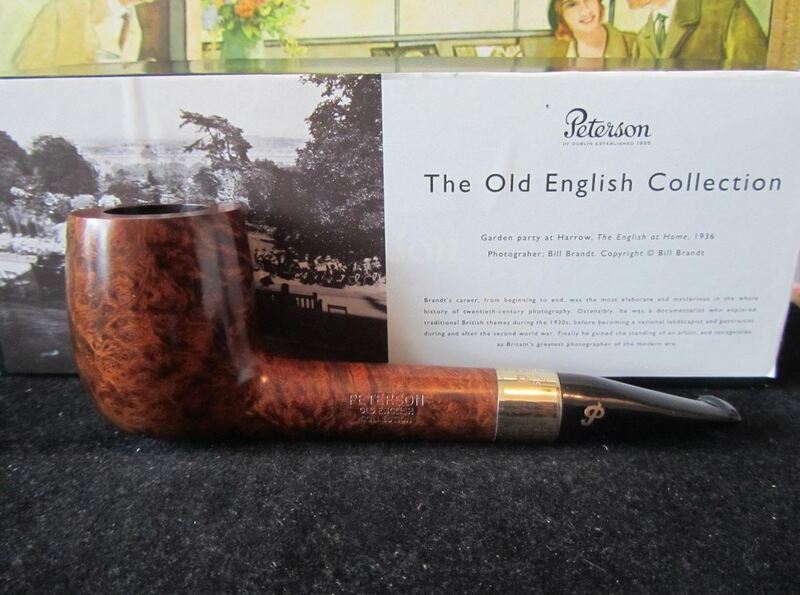 Once in awhile one of these twelve shapes will appear in estate condition on Ebay, but to see all twelve of them simultaneously and in unsmoked condition was a marvelous opportunity for Peterson collectors. I contacted George as the auctions were nearing their ends to see if he’d mind letting us use his photos and he said he’d be glad to oblige. 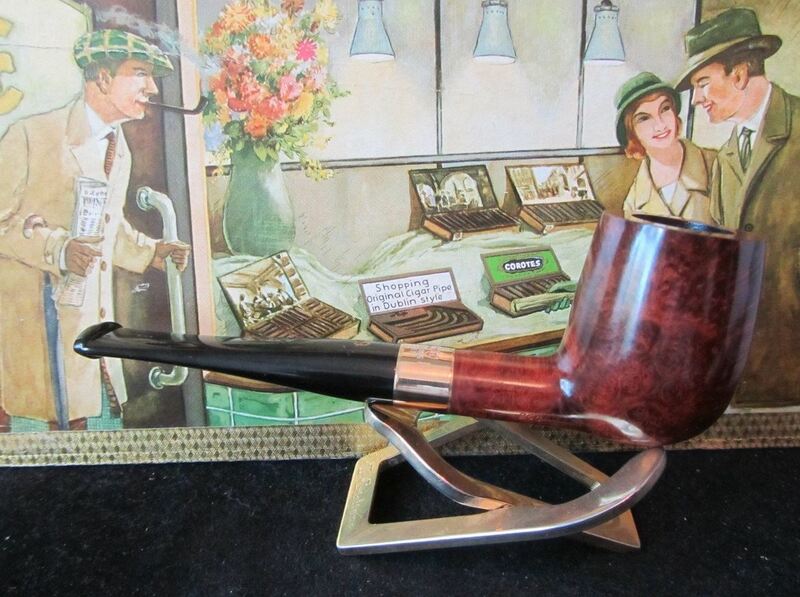 If you follow Peterson sales on Ebay, Tinashobby is well worth bookmarking, because George almost always has some great Petes on offer (http://www.ebay.com/usr/tinashobby). 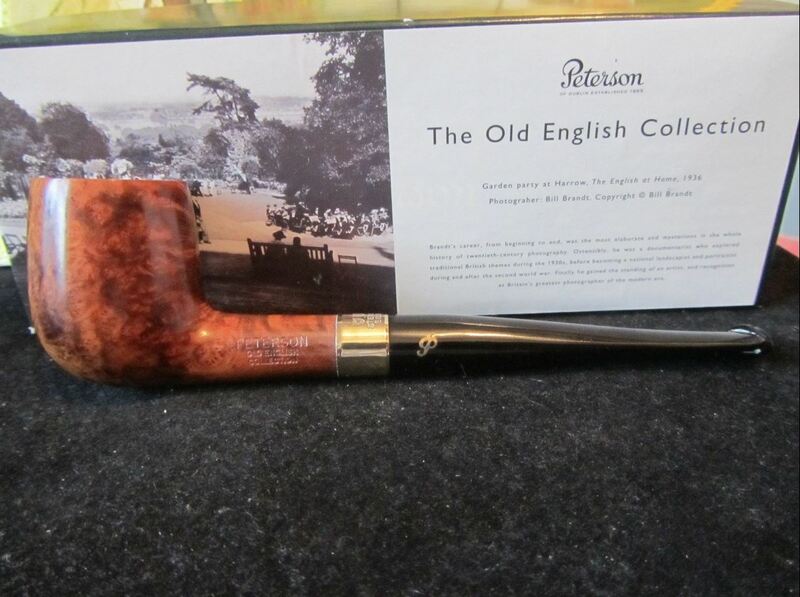 The Old English Collection is important in several regards. First, it marks the innovative and somewhat experimental early period of the Tom Palmer era, when art direction and design was headed up by Bernadette O’Neill, K&P’s Marketing Manager at the time. 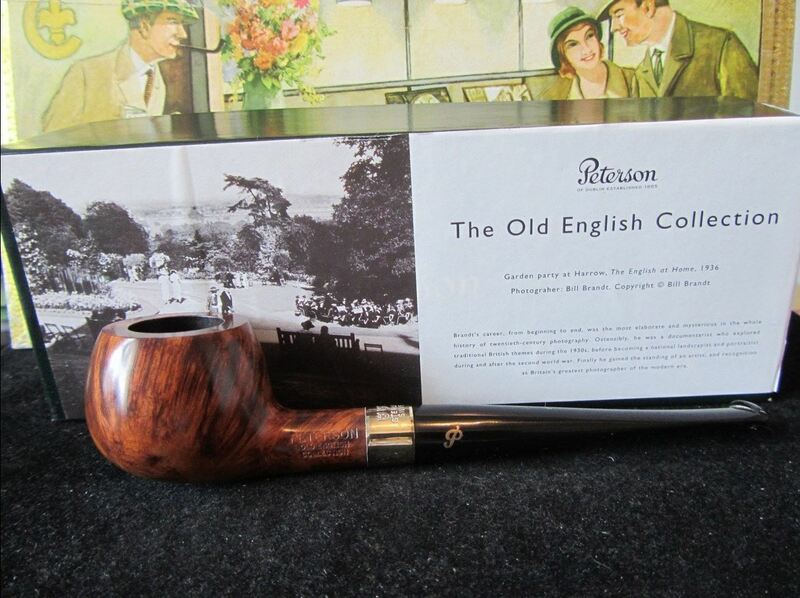 The lavish companion case as well as the individually-boxed pipes featured an early photograph, “Garden Party at Harrow” by celebrated British photographer Bill Brandt (1904-1983), something we’d normally expect from Dunhill, not Peterson. But the mid-1990s were the heyday of the Big Cigar Boom and “Conspicuous Consumption” seemed to be in every advertiser’s mind. K&P was re-launching its own cigar lines at the time and its line of accessories and appointments extended as far afield as Peterson pajamas, dressing robes and cufflinks. 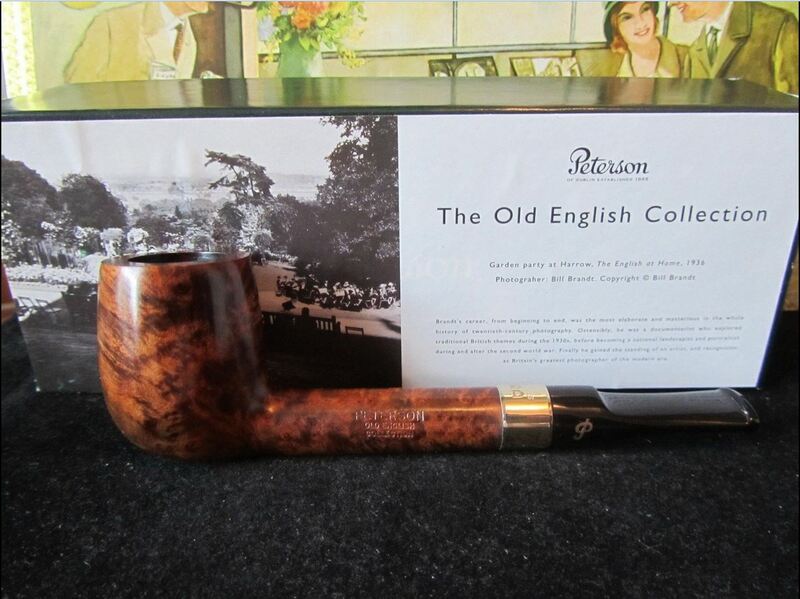 The pipe-smoking world was obviously very different twenty years ago. 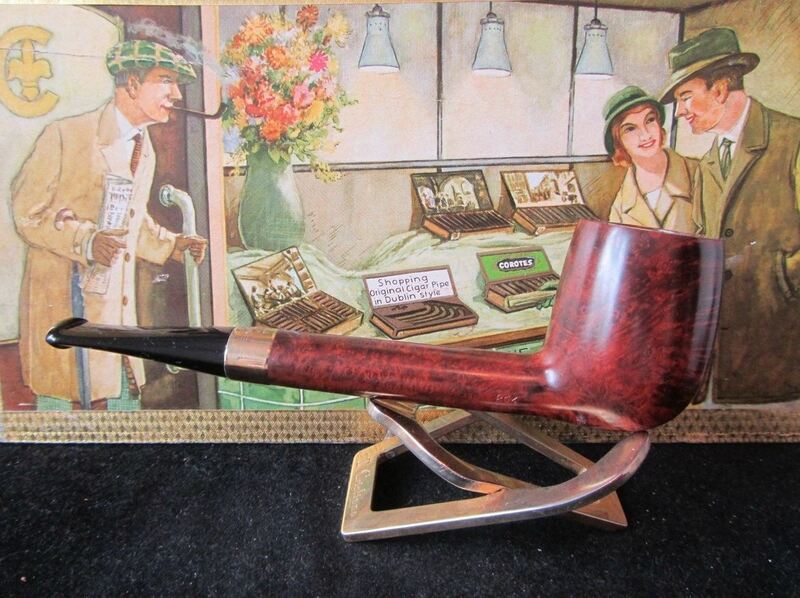 The OEC then is a product of its age—an extensive, expensive collection designed to appeal to what I’d think of as the Dunhill demographic. A second distinction concerns the gold-plated sterling bands. 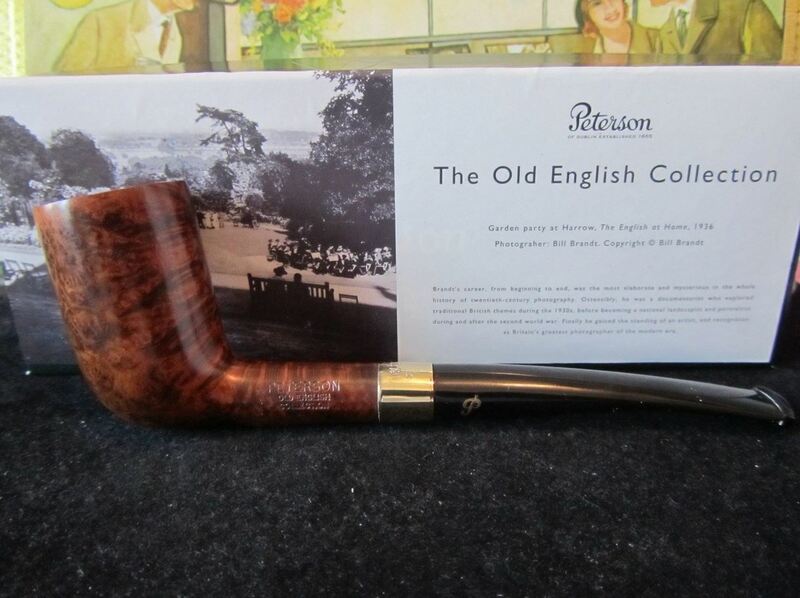 During this period K&P issued a few of its Limited Edition and other high grade pipes with gold-plated sterling bands, which is used on the OEC as well. It’s a peculiar effect as the bands give off a gold cast in some lighting and sterling in others. Complementing the gold-plated sterling, the OEC pipes feature gold-colored (brass) inlaid “P”s in the mouthpieces. The first year’s issue was hallmarked K. Nomenclature—as you can see in Fachner’s excellent photographs below—read PETERSONS over OLD ENGLISH over COLLECTION on the obverse and MADE IN THE over REPUBLIC over OF IRELAND on the reverse of the shank. 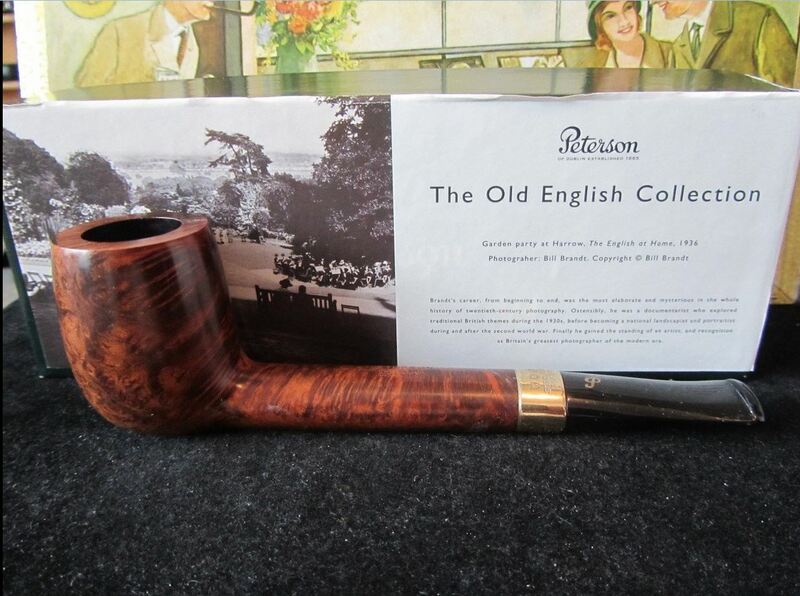 The briar used was exceptionally good, and while not unmarked, was at the upper end, with tiny sand pits and root marks left visible (as is Peterson’s practice in their better briar) and at most one or two tiny fills. 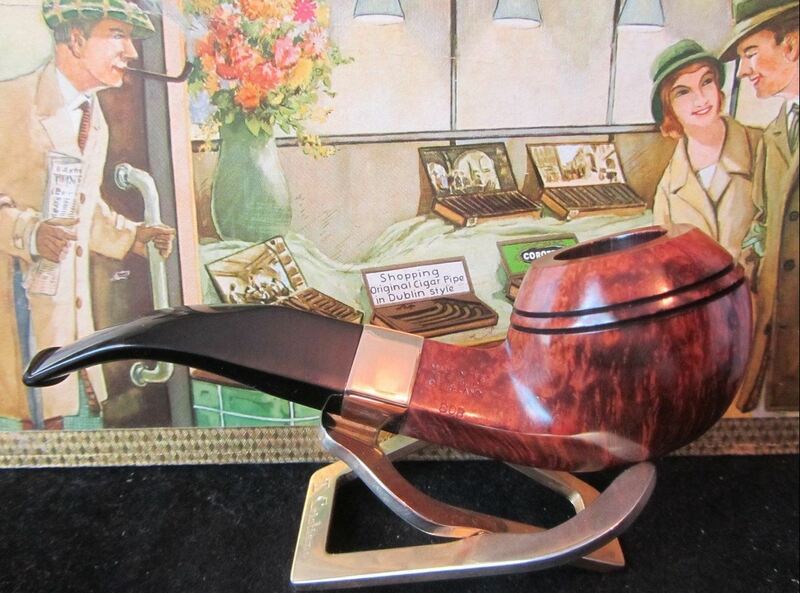 Finally, as for the shapes themselves, all have good-sized chambers, but the idea behind them—to present very English designs in sizes typical of the 1930s and 40s—means that most of them are what pipe smokers today would consider smaller and lighter shapes. 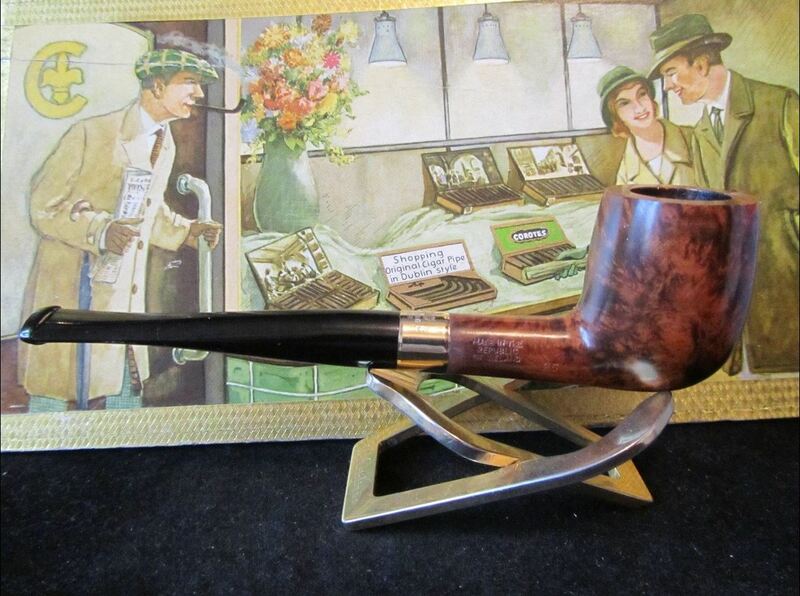 As you scroll down the photos and dimensions George Fachner provided below, you’ll see some well-known and perennial favorites like the 264 Canadian, 80 Rhodesian, the 86 Apple, the 65 Bent Billiard and the 407 Prince. But there’s also some extremely rare and interesting shapes: the 55 Liverpool, the “no-shank” Tankard and (my favorite) the 124 Dublin Stack. 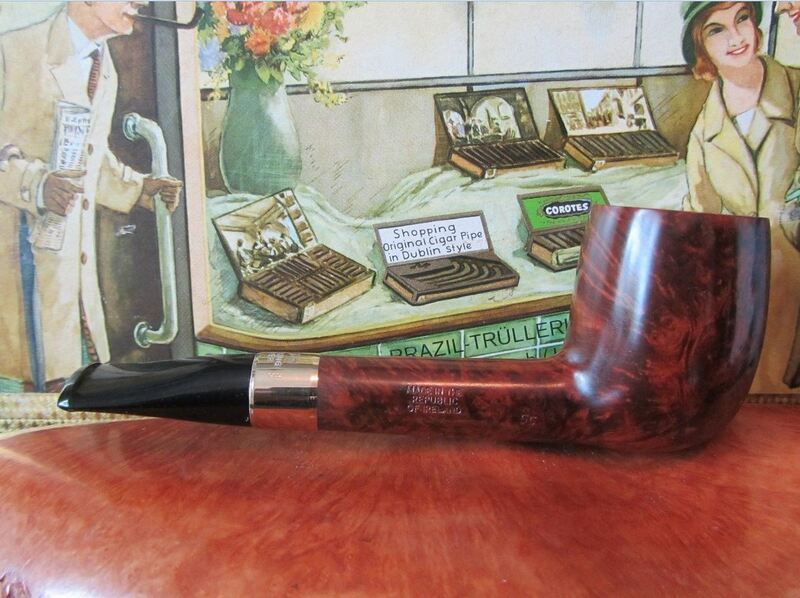 In between are shapes similar to current production: the 26 Lumberman and three billiards, the 119, 265 and 25. I’ve noted first appearances of shape numbers where I could find them in the Peterson ephemera. How could I obtain one of the 124 shape ? 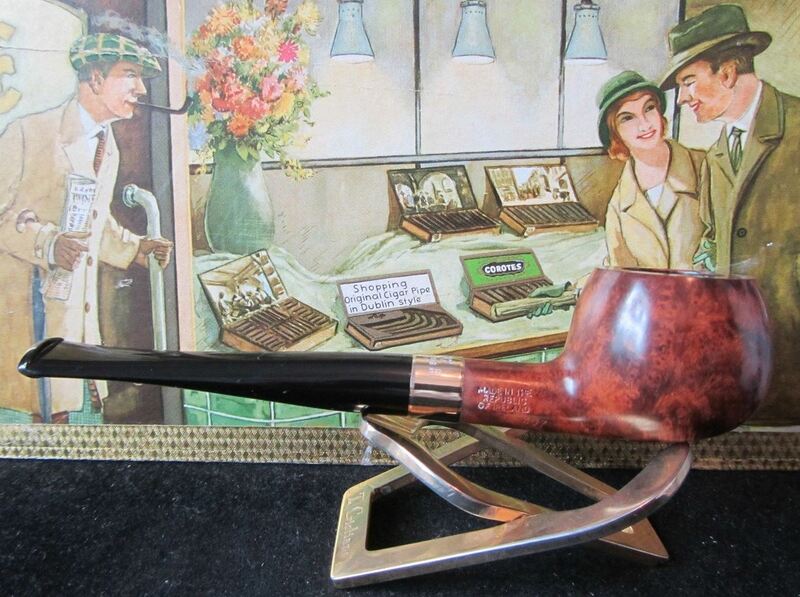 Hi Dr. Mize, if you’re interested in a new/old stock 124, contact me at pete@afinemess.org. Very interesting and informative. What a handsome and classy collection! 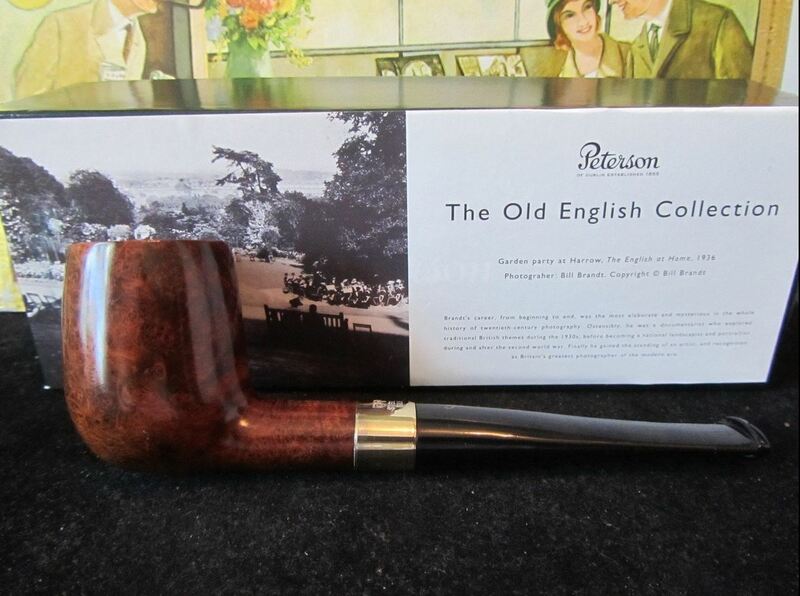 I’ve been collecting Peterson’s for several years now and this is the first time I’ve heard of the Old English Collection or knew of its existence. 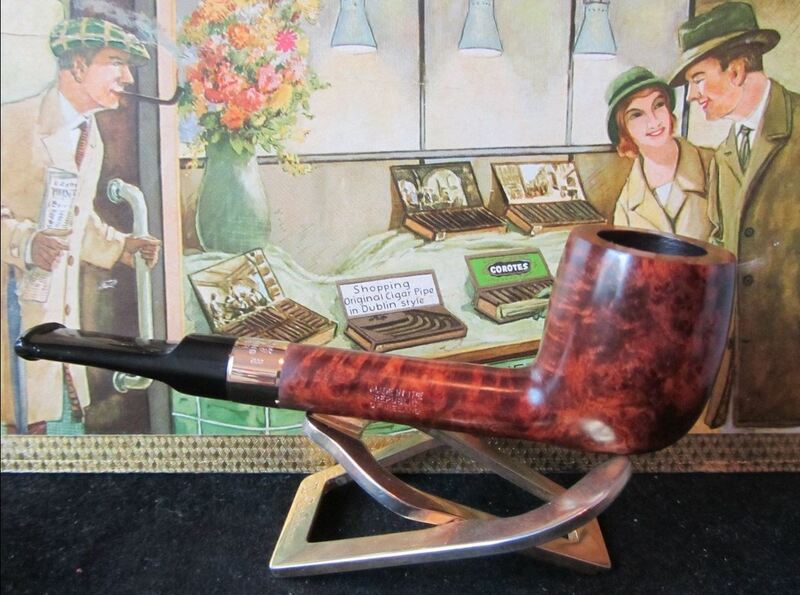 Somehow George Fachner’s eBay listings escaped me and have long since ended. I’ll include this collection as one of my searches. There are a few of these I’d love to pick up, particularly the 124 & 80B. Very nice indeed! I couldn’t agree more. I think the reason for its rarity on the market is twofold: 1) not many were sold individually, but appeared only in the quite-pricey companion-case set of 12; 2) it didn’t sell well–probably because of Reason #1, but also because gold (if memory) serves was fairly high at that point in time, making the pipes rather dear. I just finished restoring a Tankard which is part of this collection. It is truly a Leprechan’s pipe or Hobbit. It is beautiful and I would love to know how much it is worth? Hi Paul. 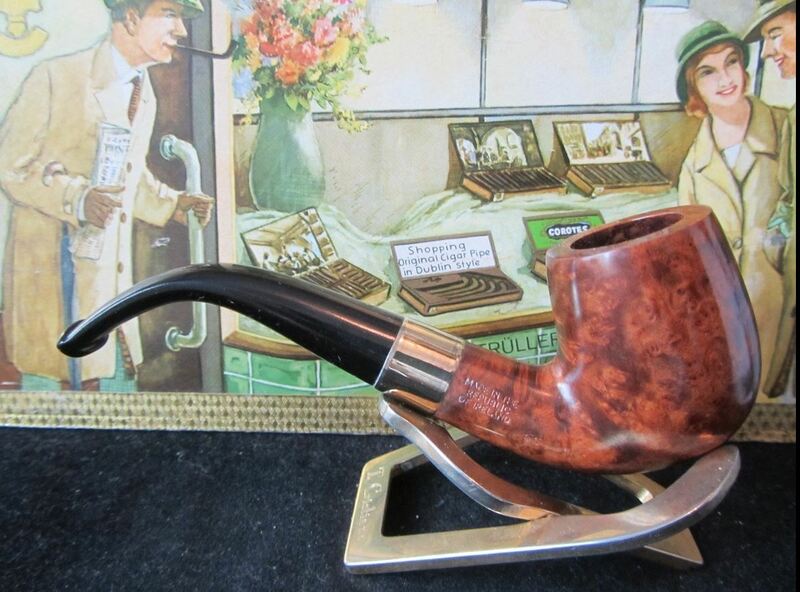 This is a rare English shape in the Peterson charts with its extremely truncated shank and gold-plate over sterling. 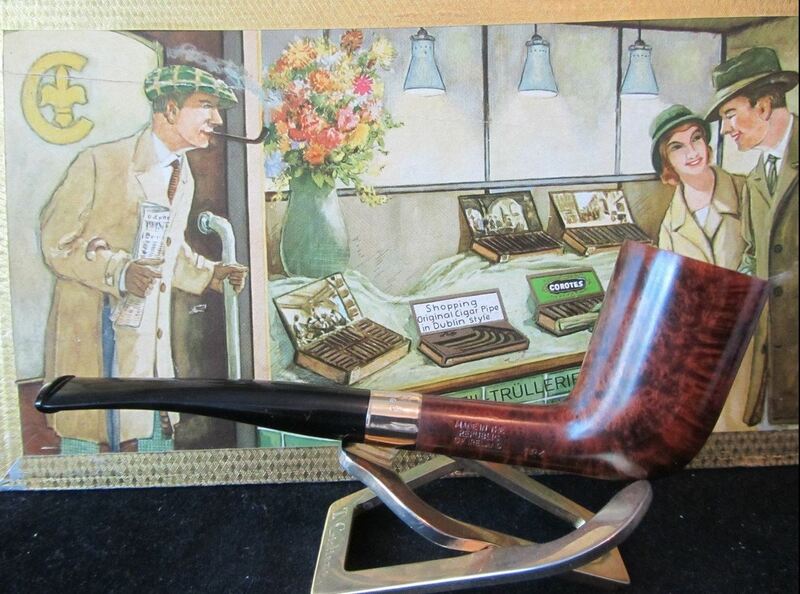 Only Dunhill has made one like this on a more-or-less regular basis. I’m not in the estate business, so I couldn’t give you a definitive answer. Only one or two has appeared on eBay in the past 5 years, but I’d say well over $100. While Peterson estate prices are rising, they won’t see a great increase until after the Peterson book is published. So you can look at them as a great value, or as under-appreciated–your choice. 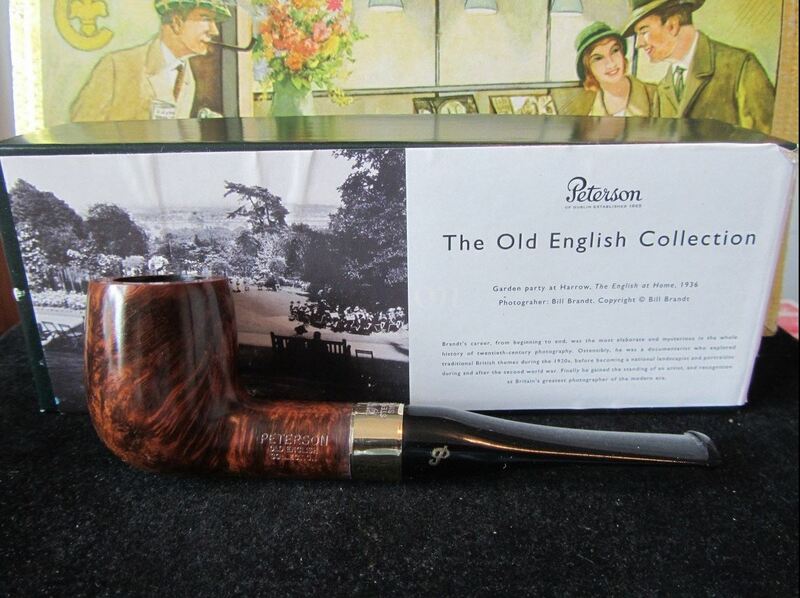 I came across this blog post with photos today after picking up a Peterson on eBay. 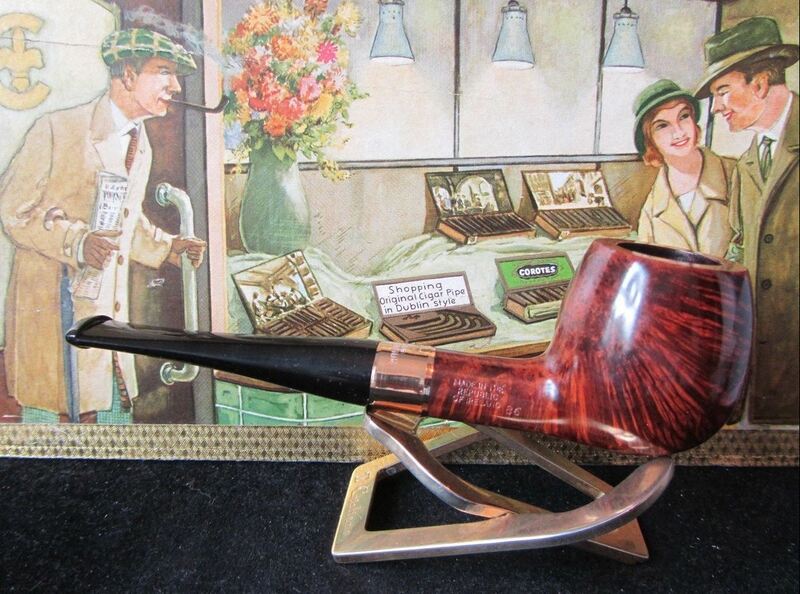 As it turn out the #86 you have in the above photo is the exact same pipe I bought on eBay. The grain pattern is unique enough to confirm from photos. Any history on that pipe? Not sure if this will get to you. 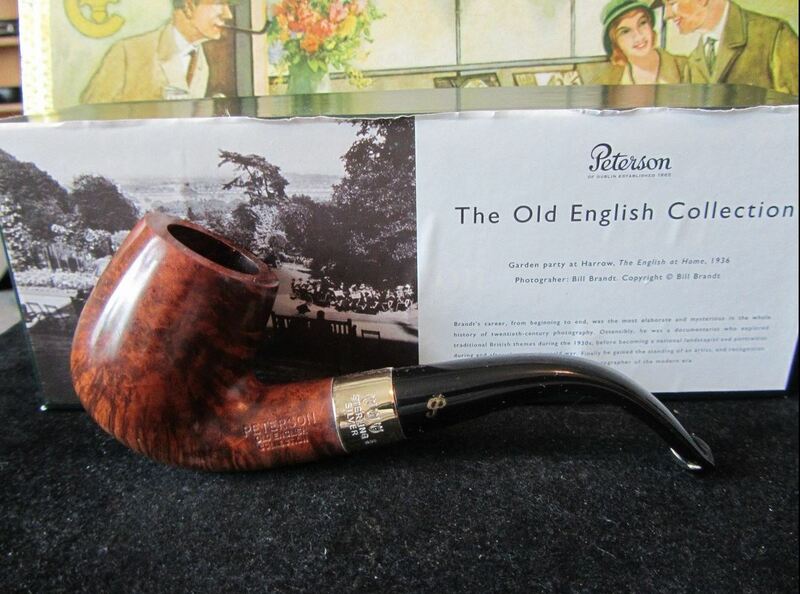 Hi Franklyn, shape 86 can be documented as far back as the 1937 catalog, and was probably in production by the mid-1920s as Peterson responded to the then new-wave of English shapes. It has been in production ever since. 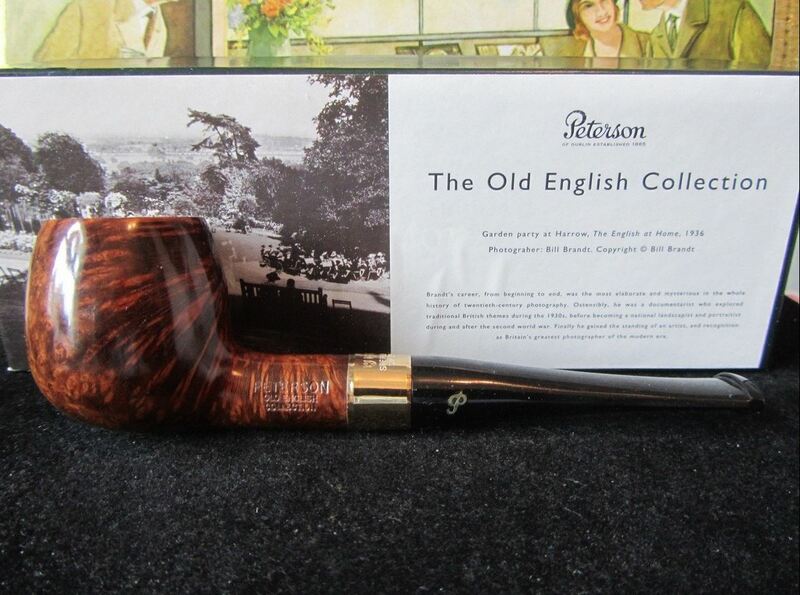 The Old English Collection story is told in the Peterson book, and you are fortunate indeed to have one of these beauties. I could certainly use a morning in the Kauai sunshine, not too far from you I think, preferably sampling coffee at the Kauai Coffee Company’s gift shop! 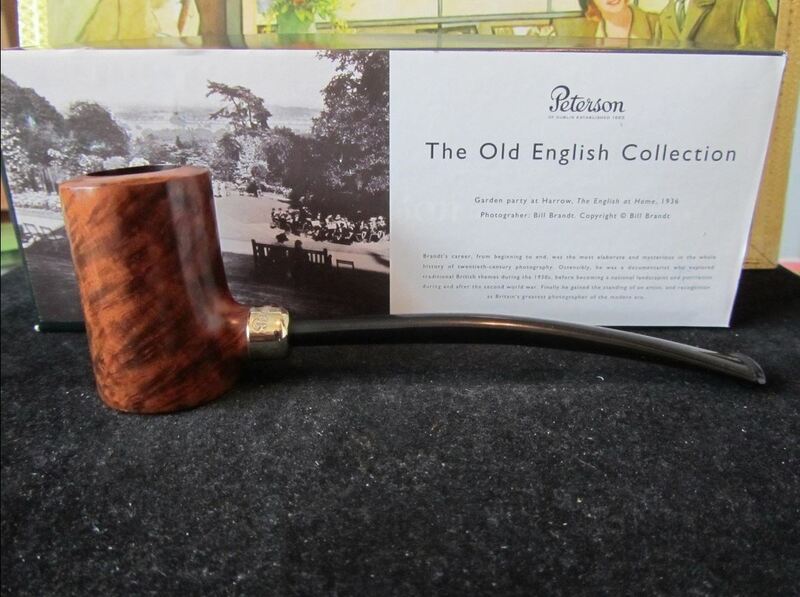 Is the photo you have in this blog post of a pipe you once owned? Or a stock photo? 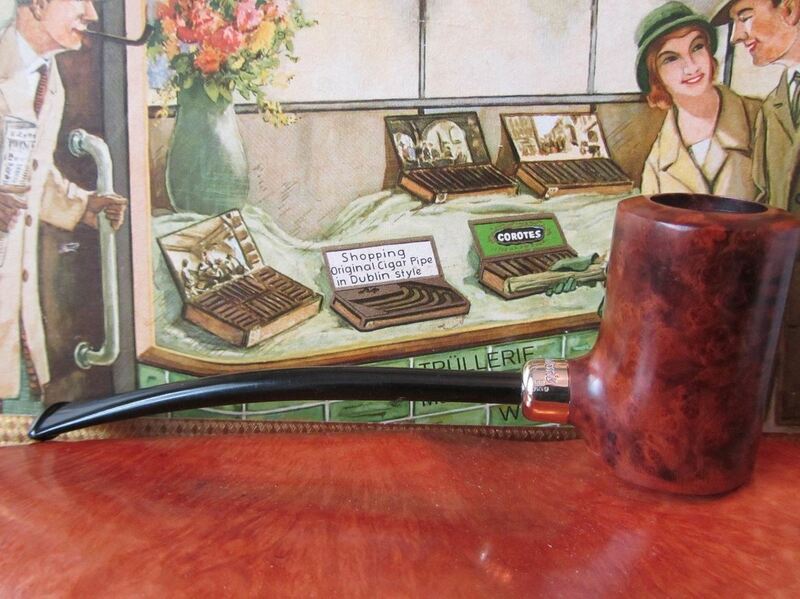 It’s unusual to see the exact same pipe, not just a shape 86, but the exact same pipe. Odd coincidence to be sure. 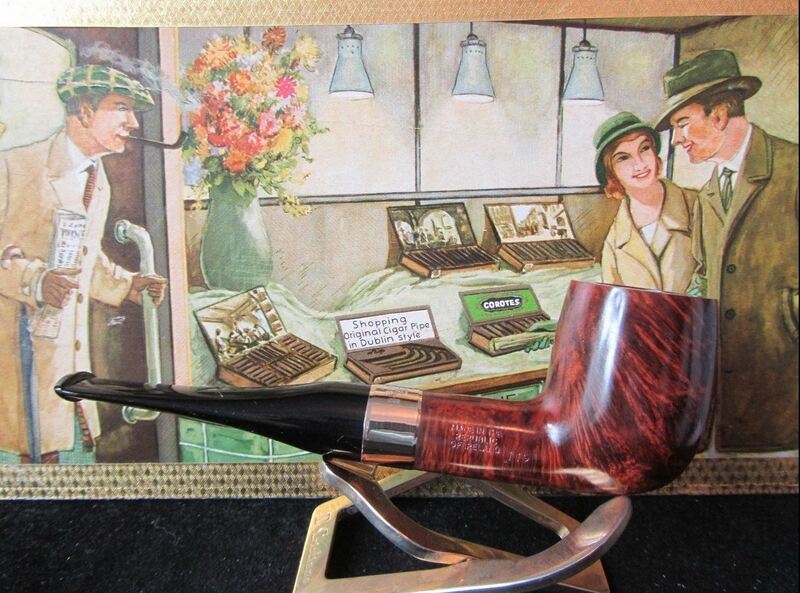 No, Franklyn, if you go back to the top of the article you’ll see they were sold by George Faschner, an eBay dealer who goes under the business name of “Tina’s Hobby.” I would imagine your pipe went to someone who then sold it to you.